Nylon, Kevlar and other synthetic fabrics: Step aside. If new scientific research pans out, people may be sporting shirts, blouses and other garments made from fibers modeled after those in the icky, super-strong slime from a creature called the hagfish. The study appears in ACS’ journal Biomacromolecules. Lead author Atsuko Negishi, her supervisor Douglas S. Fudge and colleagues explain that petroleum is the raw material for making modern synthetics. Rising prices and the quest for more sustainable alternatives have led scientists to consider the possibilities of using protein-based raw materials, such as spider silk. Another candidate comes from the hagfish, an eel-like fish that produces a thick slime to protect itself against predators. 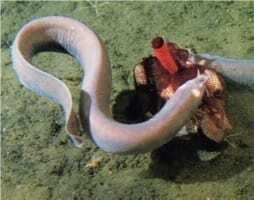 A single Atlantic Hagfish can produce quarts of slime in seconds. It clogs the gills and may suffocate other fish. The slime consists of tens of thousands of remarkably strong threads, each 100 times thinner than a human hair. The scientists set out to investigate spinning spider-silk-like fibers from the proteins of these slime threads. They developed a method for drawing hagfish slime thread proteins into fibers comparable to lab-made spider silk. It involved casting a thin self-supporting film of thread proteins on the surface of a salt solution, then grabbing it with forceps and lifting it upwards so it collapses into a single strand. The threads in hagfish slime, they indicate, might be models for synthetic fibers made from renewable, naturally occurring proteins.